Whether you want to call it Amatriciana or, as the Romans usually do, simply and laconically “Matriciana”, one rule obtains: it is all about the ingredients. For reasons of blogosphere self-preservation, I will refrain from getting into the ‘origins’ of the ‘real’ A/Matriciana because I haven’t the time just now, it being a hornet’s nest of a topic and best left for another occasion. 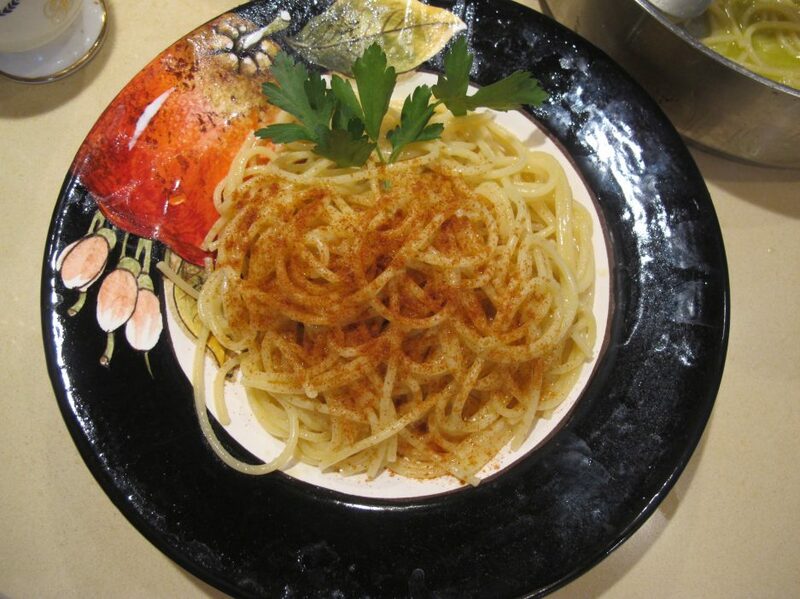 The subject of a true A/Matriciana ignites fiery Pasta Policing and wars. However, I can pacifically attest to the following: a Roman Matriciana concedes the inclusion of onions (which I don’t usually bother with) and a splash of wine – again, something I don’t bother with, although I did this time with the recipe I am outlining below. When making this particular Matriciana, it was Charles Scicolone who came to mind. We were having a jolly nice lunch together with his wife Michele and our friend Michelle Smith earlier this year at the now Michelin-starred restaurant called “Da Sora Maria e Arcangelo” (Michele, Michelle and Michelin … all these Miches !) in Olevano Romano. Charles ordered a Matriciana, one of his favourite pastas. He said he liked it well enough … and the pasta itself was fresh and home-made … but there was an unsaid ‘but’ hovering in the conversation and eventually he spilled the beans. Instead of throwing away these trimmings, also known as “cotiche” in Italian, once boiled, they can be used to flavour many another good dish (such as pasta e fagioli for instance). I also had the notion that these trimmings might impart another edge of ‘flavour’ to the cooking water of the pasta. There is no need to wait for the water to come to the boil: you can add the trimmings of the guanciale (i.e. the exterior lining/edge that is not normally eaten and all too often thrown away) straight away. I poured some white wine into the large saucepan and turned up the heat. As you can see, below, the guanciale is cooked but not ‘crisp’ as such. This guanciale is what is going to make the matriciana sauce taste good! It’s actually easier to do all this than it is to give instructions ! 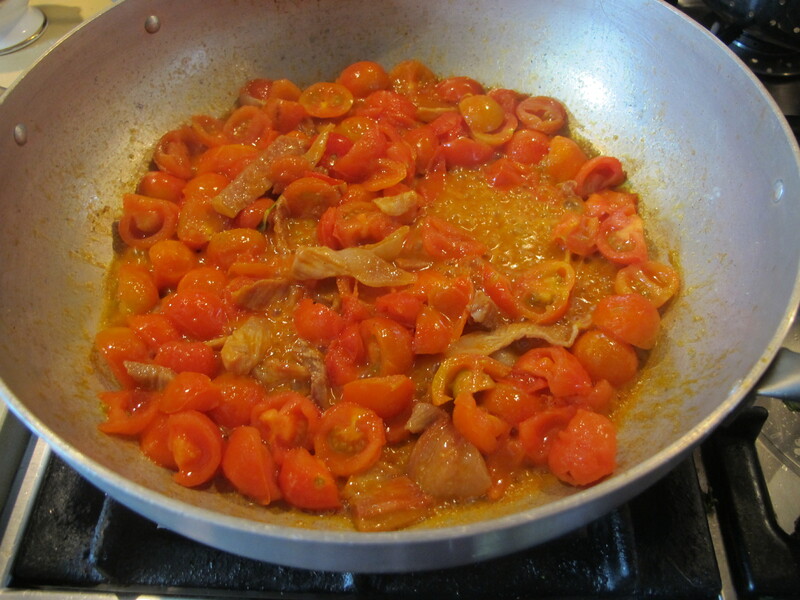 Add fresh or tinned plum tomatoes to the saucepan and let it cook down. Add salt and even a bit of sugar if necessary. Okay, so now we can remove the cooked guanciale trimmings from the boiling water and allow them to cool. Okay so the water has come to the proverbial rolling boil and is looking pretty oily, in a good way!, all that fat. 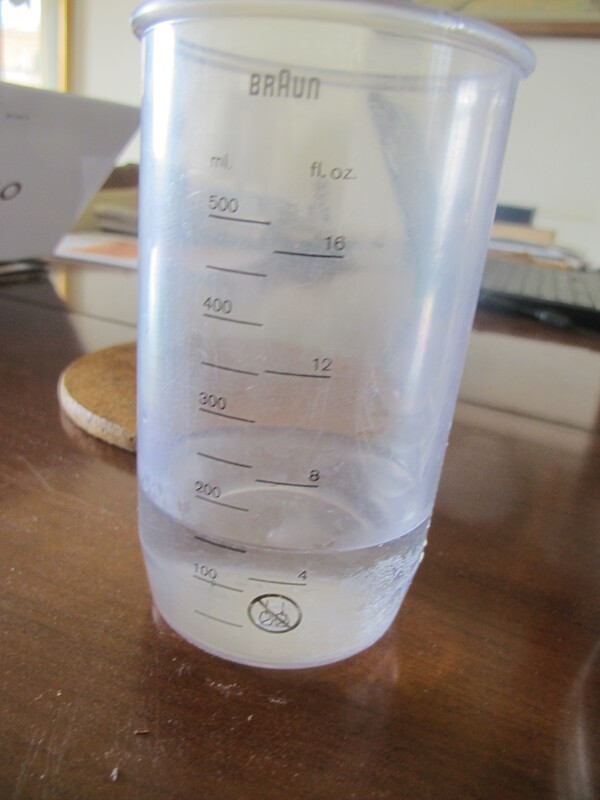 All that is called for now is the required amount of coarse sea salt (roughly 10g per litre of water is the rule of thumb). Add your pasta and we’re nearly there. When cooked all dente, drain the pasta (spaghetti in this case, bucatini are also very common in Rome) directly into the saucepan … turn the heat up and add a little bit of the cooking water. You know the drill. And no bits of green, please! No guilding this lily with basil or parsley or mint. Just unadulterated matriciana sauce. This is not supposed to be a ‘light’ sauce. It’s supposed to keep you company all afternoon as you let your body lingeringly digest it. 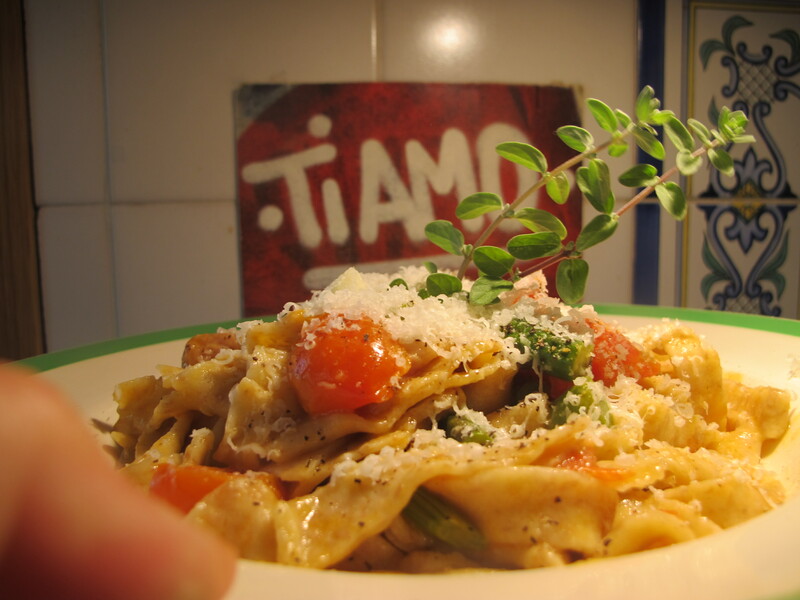 A snowfall of pecorino over the pasta and last but not least … the crispy guanciale on the very top. I don’t normally have any leftover sauce when I make Coda alla Vaccinara … it all gets mopped up with hefty doses of good bread. This time, however, I had decided to use the extra sauce to make a different kind of supplì, the rice croquet that is breaded and deep fried, and is usually eaten as an antipasto or as street food. Well, my intentions were good but sometimes the body baulks at too much effort on a Sunday …and the end result was, instead, a risotto. Nothing to be ashamed, of by all means … Take a look. 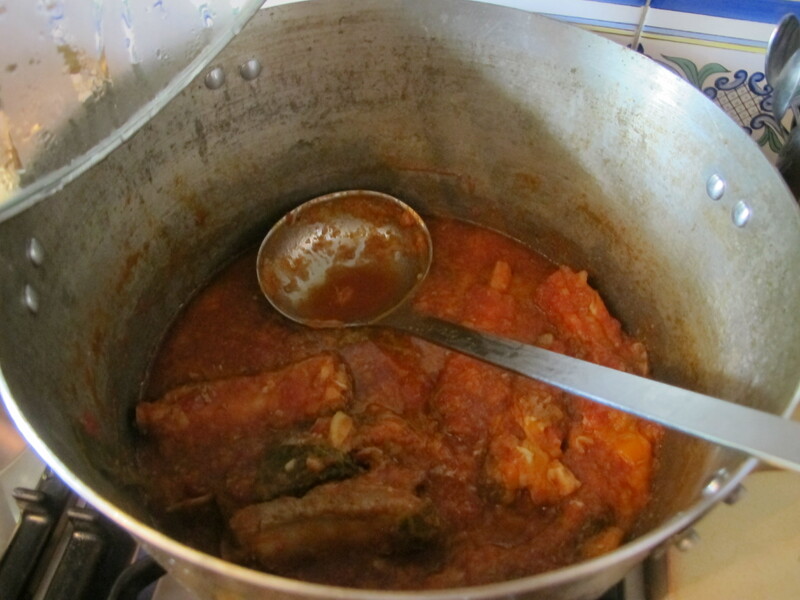 I added the first ladle of the sauce, and it sizzled fiercely and I had to step away – so watch out if you intend to repeat this recipe. I stirred the rice for a few seconds and then quickly added another couple of ladles and carried on as I would with any other risotto. I had to remove some of the celery leaves, however, because they just kept ‘getting in the way’ of the stirring. No matter. 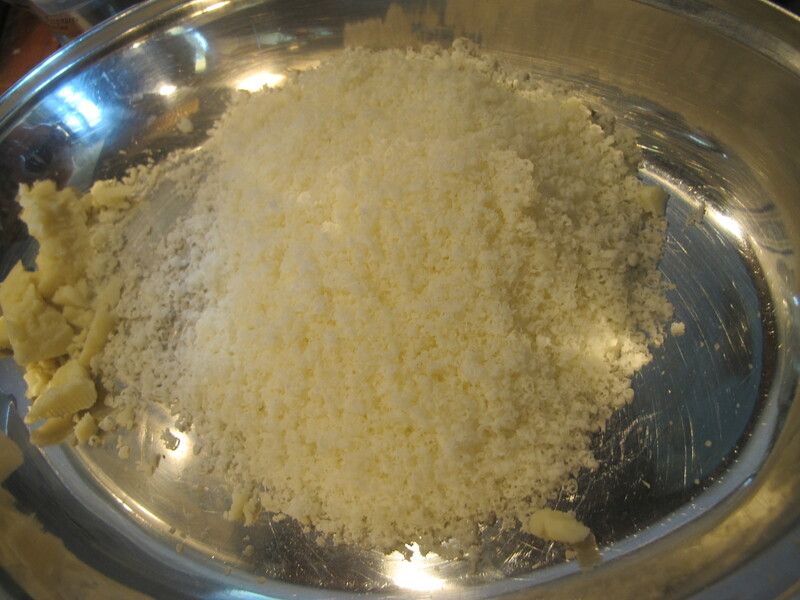 Once the rise was cooked, I added a knob of butter and plenty of grated pecorino romano cheese. As you can see, hardly any celery leaves left in the risotto. Less worry over them sticking to our teeth in a most unsightly way. I then put the risotto inside a pyrex dish. We were going to a friend’s house for a celebratory aperitivo dinner … and this dish came in very handy and was duly appreciated, served just warm from the oven. Sometimes it pays to be ‘lazy’ ! And it’s good to know that one can continue Loving the Leftovers ! 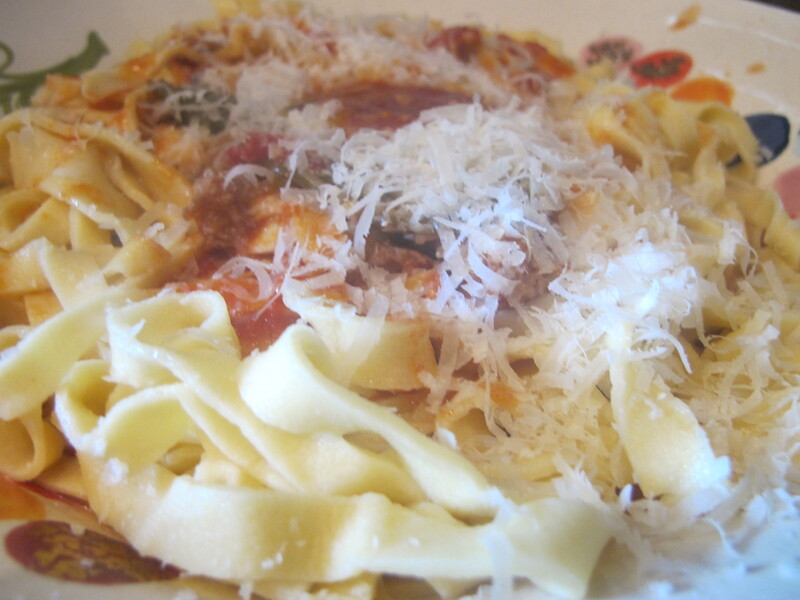 Here are photos of another of my home-made pasta endeavours recently … the photos speak for themselves. The sauce was what was left over from the night before’s dinner, spare ribs and sausage to accompany polenta. The grated cheese in question was pecorino romano. What a shame we can’t convey tastes over the blog ! 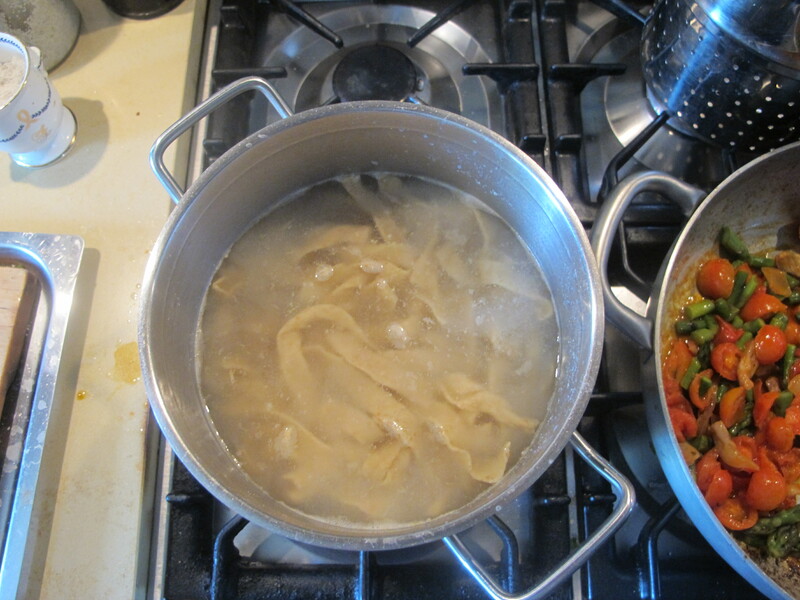 Here are photos of another of my home-made pasta endeavours recently … the photos speak for themselves. The sauce was what was left over from the night before’s dinner, spare ribs and sausage to accompany polenta. The grated cheese in question was pecorino romano. What a shame we can’t covey tastes over the blog ! 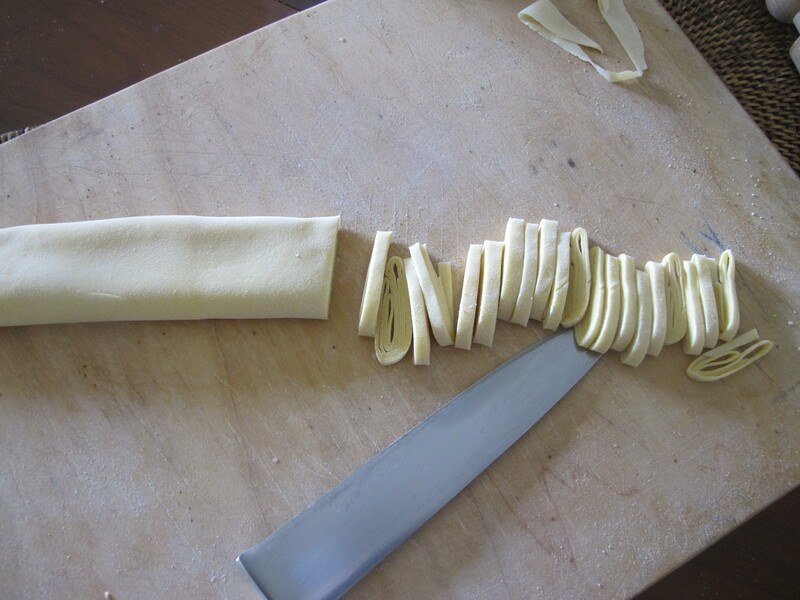 My mother is a dab hand at making home-made pasta – her fingers dance all over the wooden board, known as ‘spianatoia’ in Italian, and the precision with which she slices the final rolled-out dough is incredibly neat, almost geometrically perfect. She only recently confided to me that she had learned the art of pasta making from the signora Pierina who hailed from Bologna (my mother grew up in Frascati, near Rome), which of course is home to the art of egg-dough pasta. 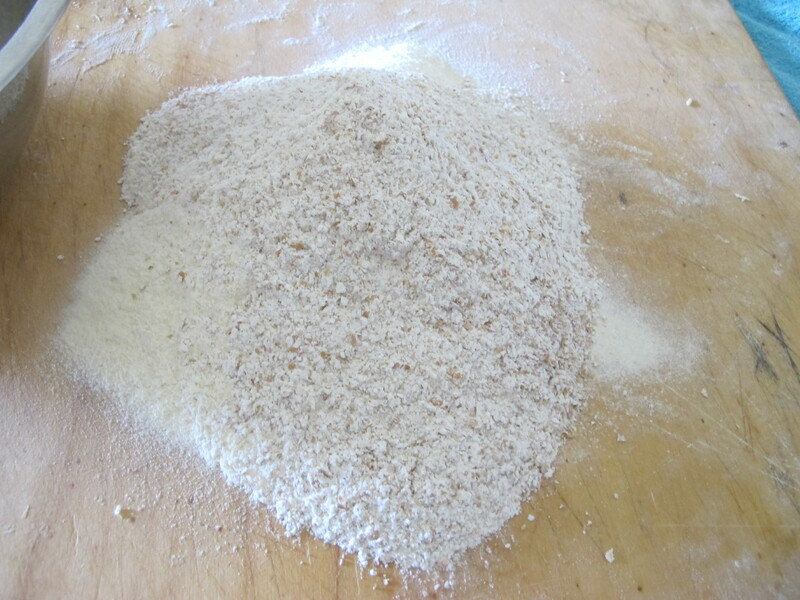 It is called ‘sfoglia’ and is made using tender wheat flour (00 flour as it is known in Italy). 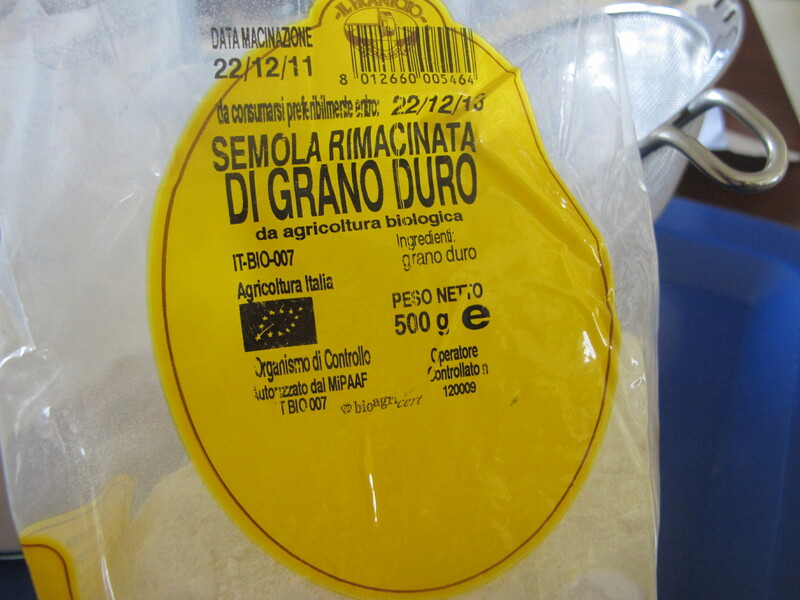 In central and especially in Southern Italy, eggs were eschewed from the pasta picture and the dough was and continues to be made with flour and water only, the flour in question being the same as that used for commercially dried pasta (as well as bread), the ‘hard’ durum wheat called ‘semola di grano duro’. 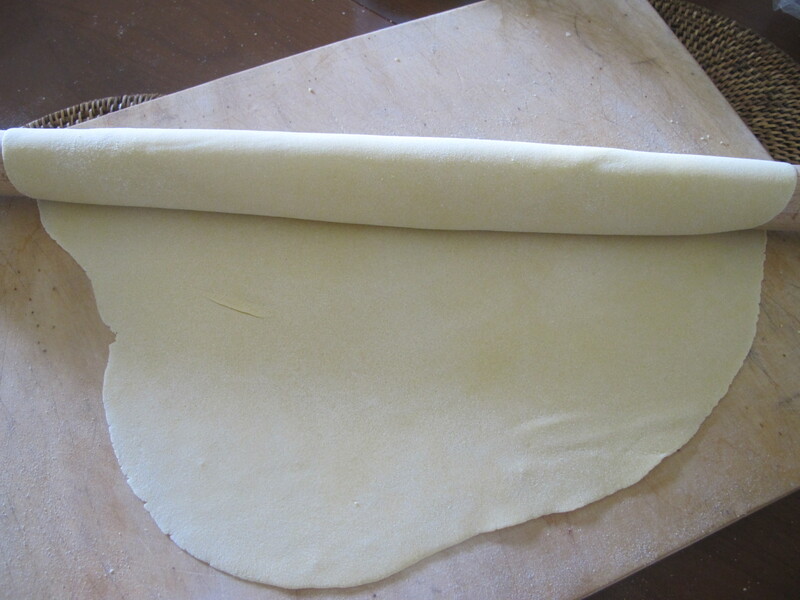 The typical sfoglia is rolled out very thinly, and is soft and velvety to chew. 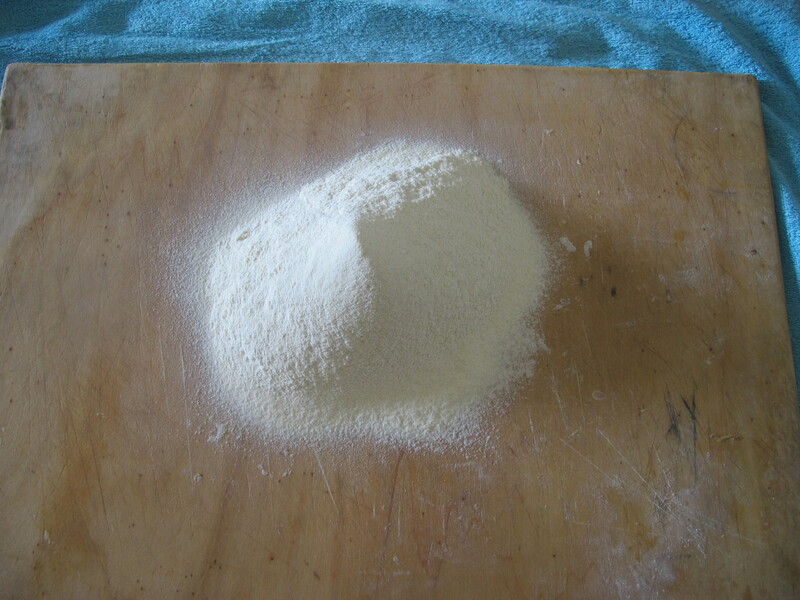 The pasta made using durum wheat, instead, is a little more resistant to the tooth, it has a little more bite. In neither case, however, does one worry about having to cook it ‘al dente’ – and besides, fresh pasta takes far less time to cook, ranging from 2-3 minutes max from the minute the water starts boiling again after the pasta has been added. 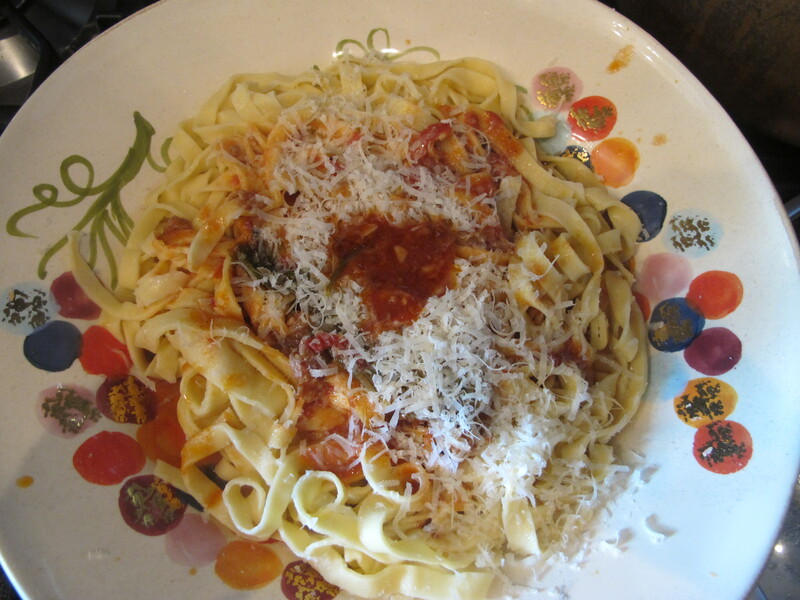 I confess that I do not often make my own pasta – I buy it either freshly made on the day at a local ‘pastificio’ (pasta shop) or else use commercially dried egg pasta. My favourites seem to hail from the Marche, where my in laws come from. The pasta from Campofilone and from Camerino are really really good, try them one day. 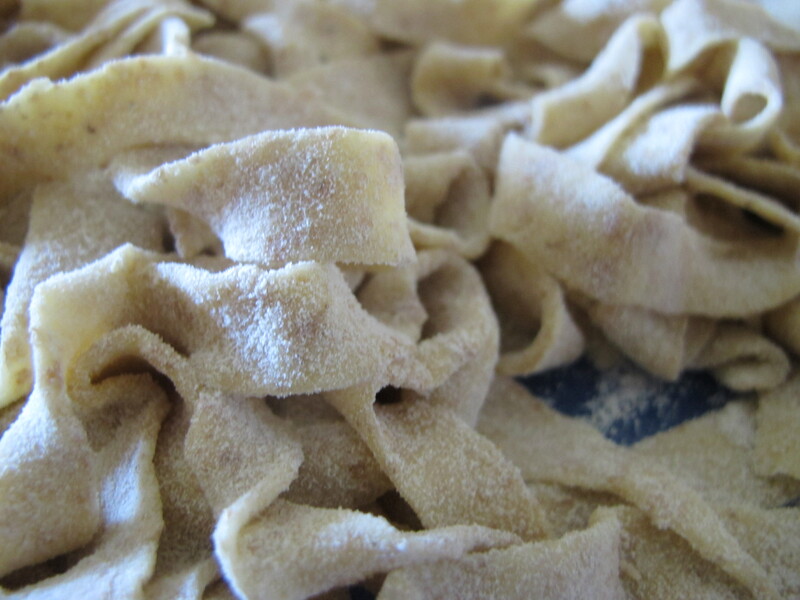 The egg pastas of Marco Giacosa typical of Piedmont (tajarin or tagliolini) are top notch. Having been asked to conduct a cooking class around pasta making, I thought it would be a good idea to get some practice in and so I became a bit of a pasta fanatic recently – making it at least twice a week. It had me experimenting too … using a mix of both 00 flour and durum wheat flour, hence the ‘fusion’ in title of today’s post. Always use the best flour you can get your hands on and these days I won’t touch flour that is not organic. The brand I used today is Molino Conti which is in Lazio, and not very far from Tivoli. The table you see is our dining room table. 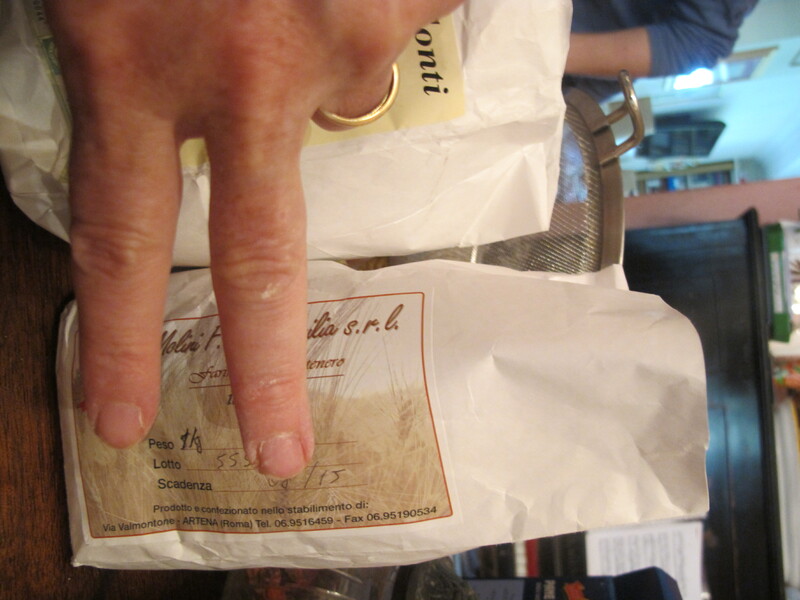 My three fingers are there to show that I weighed out 300g of the durum wheat flour. And there it is … 300g of sifted flour resting on the wooden ‘spianatoia’ (it might help if I spelled it as it is pronounced: sp-yah-nah-toe-yah). The spianatoia in question was placed over a towel on the dining room table. And now I decided to add 200g of whole wheat, tender wheat flour this time (as opposed to Durum wheat). 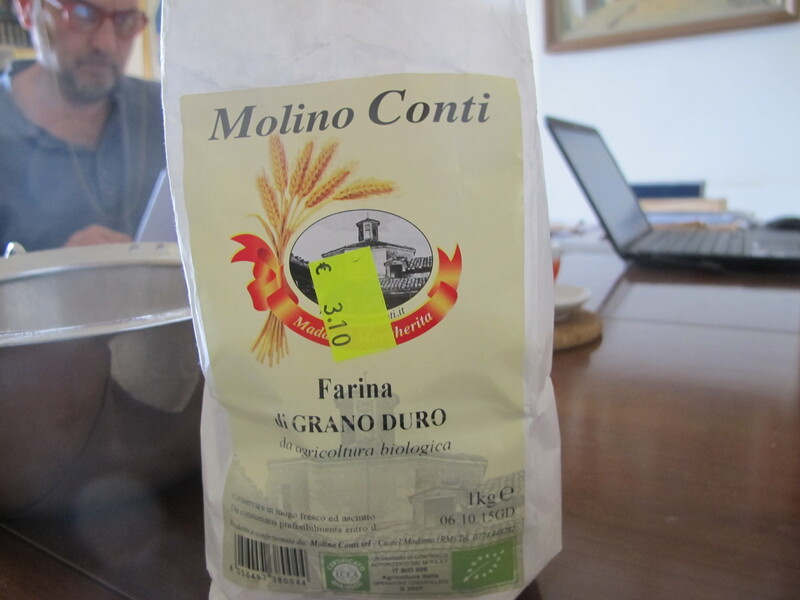 The brand of this flour is Molino Fratelli D’Emilio, from Artena … which is even closer to Frascati than Tivoli. Artena is famous for its good bread. And I mixed the two flours up. I did not sieve the whole wheat flour. 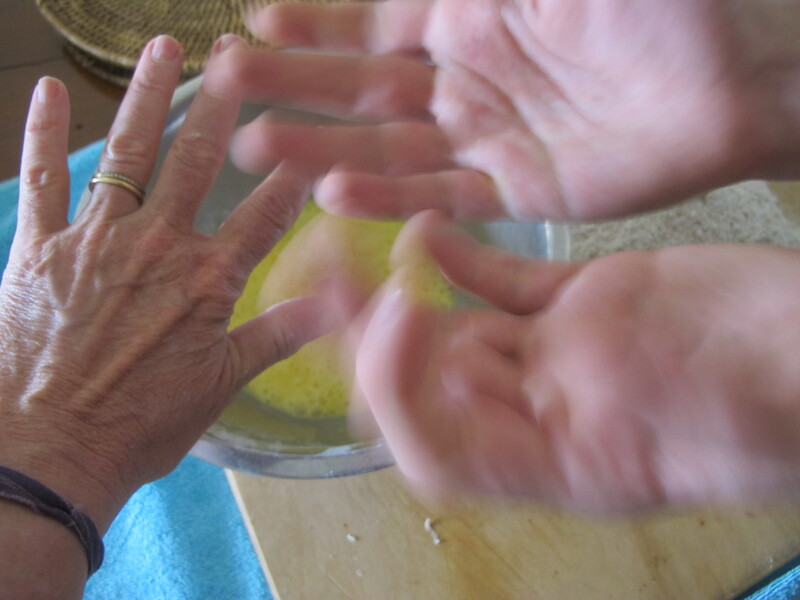 I then set aside 5 whole eggs (1 egg for each 100g of flour) … and my son was having fun with me while I was taking this photo … adding his own hands to the photo just to confuse the reader even more ! I mixed the eggs in with the flour and started making a dough …the dough was very hard, however, too hard indeed for me to knead and so I just had to add some water to soften it — and to avoid a sprain in my fingers! I ended up adding 150ml of water to the dough in order to be able to knead it properly. The dough required 10 minutes of kneading with my hands for it to become soft enough. I then covered it in clingfilm and set it aside to ‘rest’. Any pasta dough has to ‘rest’ at least 30 minutes. This will make rolling it out afterwards much easier. 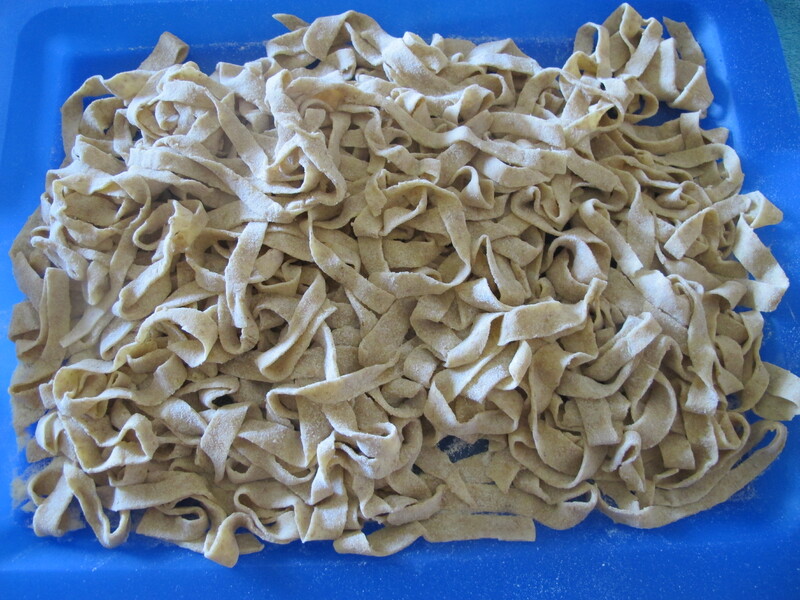 I rolled out the dough into strips … quite thick ones, called “fettuccine” … and here they are ! 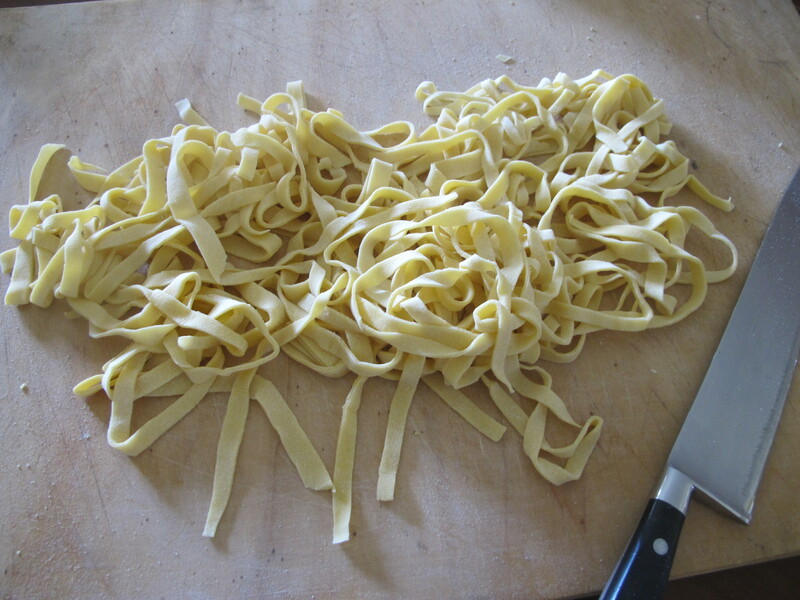 It’s a good idea to shower the freshly sliced fettuccine with plenty of flour, so that they won’t stick together. And the sauce? 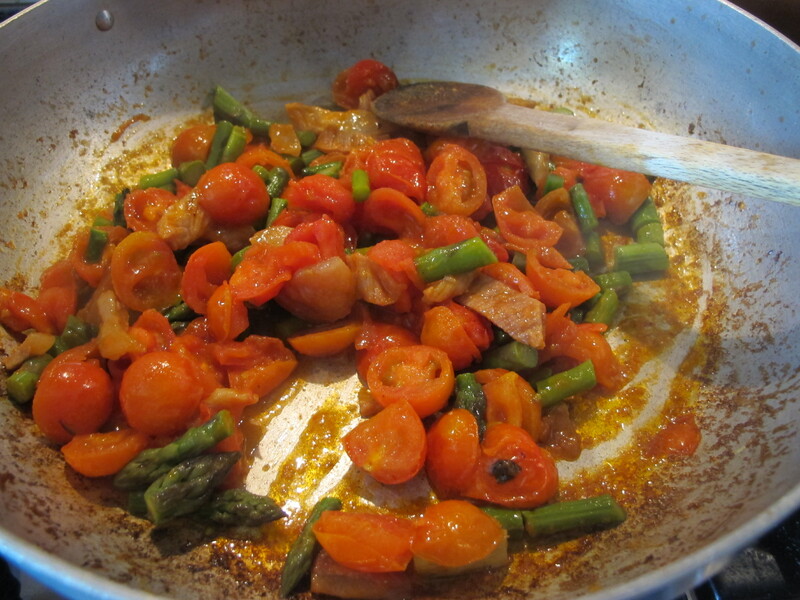 I had some asparagus left over from the day before … I cut up some cherry tomatoes and cooked them in a saucepan with olive oil, a clove of garlic and slices of pork jowl (guanciale). 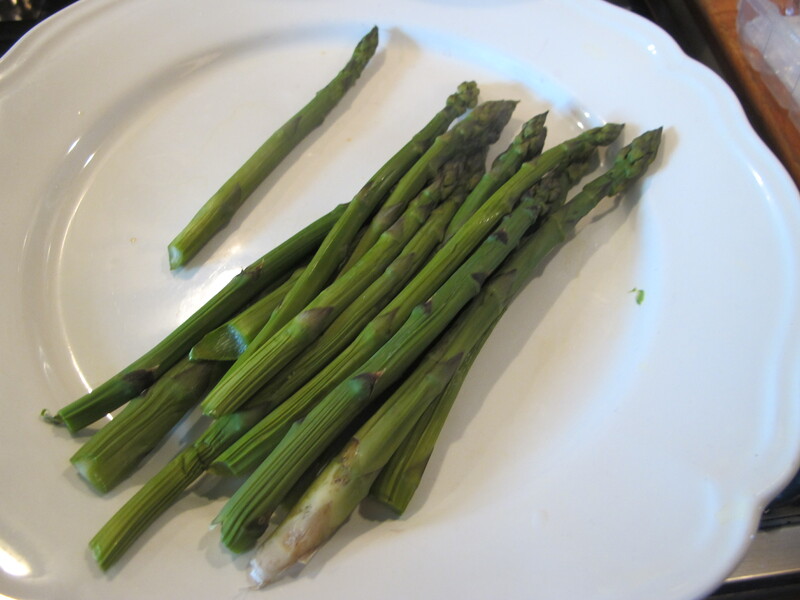 I cooked the sauce for about 15 minutes and add the asparagus only towards the very end. 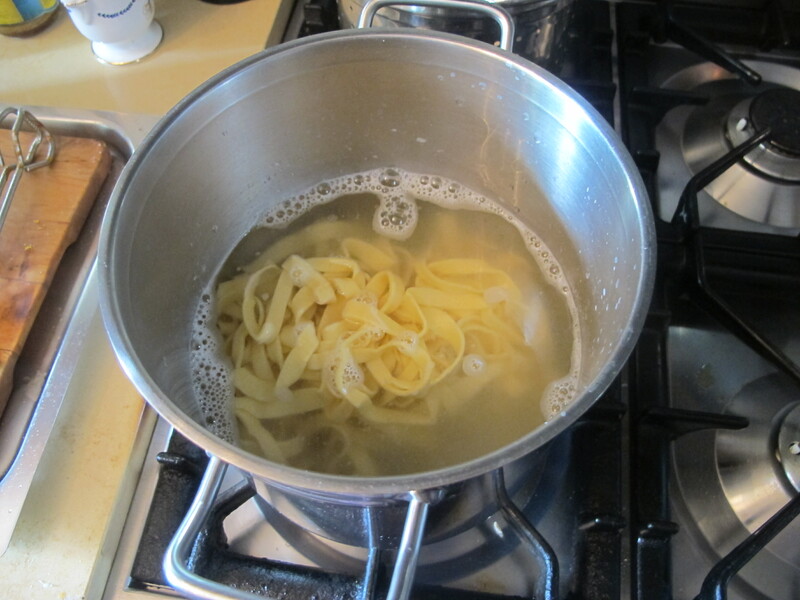 It does not take long for the fettuccine to cook: about 3 minutes. Never throw away the cooking water ! 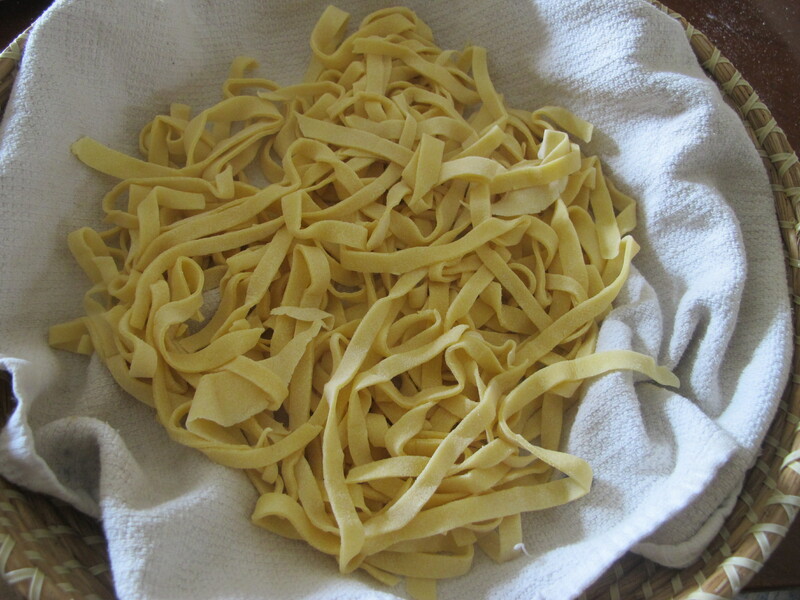 fresh pasta is very very thirsty and will soak up anything in sight ! Indeed, I had to add about one cup of the cooking water to the fettuccine as I mixed them up with the sauce directly in the saucepan. 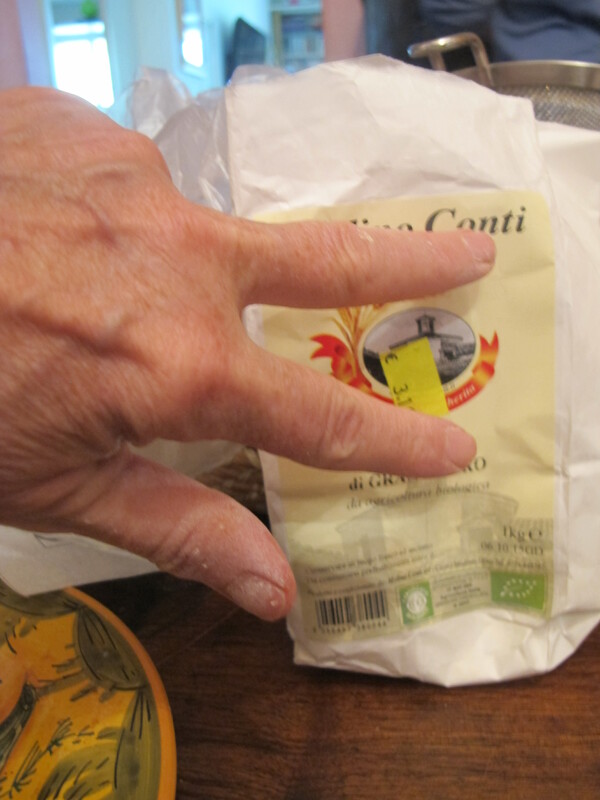 I grated some parmigiano … And there we are ! 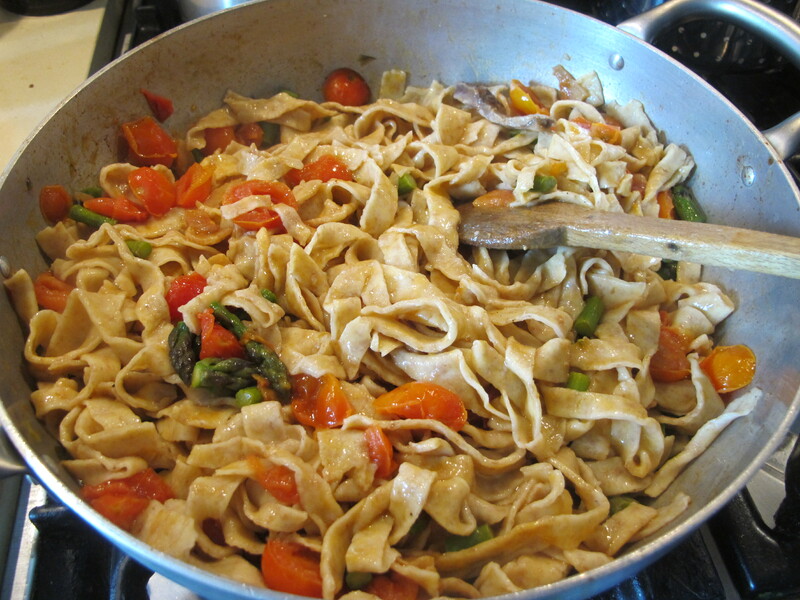 Home-made fettuccine with asparagus and tomato sauce. Buonissime. Buon appetito ! And yes, my boys were very happy with their lunch that day.